If you had invested र 10 Lacs in Reliance Equity Opportunities Fund – Growth Plan – Growth Option, during the NFO (launch date March 28, 2005) and started withdrawing र 8,000 per month after one year then the current value of your investment would have been र 46.06 Lacs even after withdrawing र 9.84 Lacs through 123 SWP instalments of र 8,000 each (Based on June 16, 2016 NAV). To come to the above conclusion we have presumed that the lumpsum investment of र 10.00 was made on the Scheme inception date i.e. March 28, 2005. We have also presumed that the monthly Systematic withdrawal of र 8,000 was started after one year on the 1st of every month so that each and every SWP withdrawal amount becomes tax free (start date September 01, 2006). From the above chart you can see that you would have withdrawn a total of र 9.84 Lacs till June 2016, through 123 equal monthly SWP instalments of र 8,000 each, thus, you would have got a tax free return of 9.6% every year. Even after withdrawing a tax free amount of र 9.84 Lacs, the current value of your investment is amazing र 46.06 Lacs! You have withdrawn 123 equal instalments of र 8,000 from your initial investment of र 10.00 Lacs, and after two more SWP instalments you initial investment is totally exhausted. However, you current value is still a whopping र 46.06 Lacs! (Based on NAV of June 16, 2016). The interesting point is that when the market was hovering around its life time high during March 2015, Reliance Equity Opportunities Fund – Growth Plan – Growth Option NAV on the SWP date of 02/03/2015 was र 78.2683 and the total value was at र 54.08 Lacs which is approximately र 8.02 Lacs more than the current value. Please note that you withdrew another 15 instalments from the highest value point of 02/03/2015 to till today’s value. We have analysed similar samples with other Mid Cap funds and found that SWP returns of Reliance Equity Opportunities Fund – Growth Plan – Growth Option was one of the best amongst its peers. 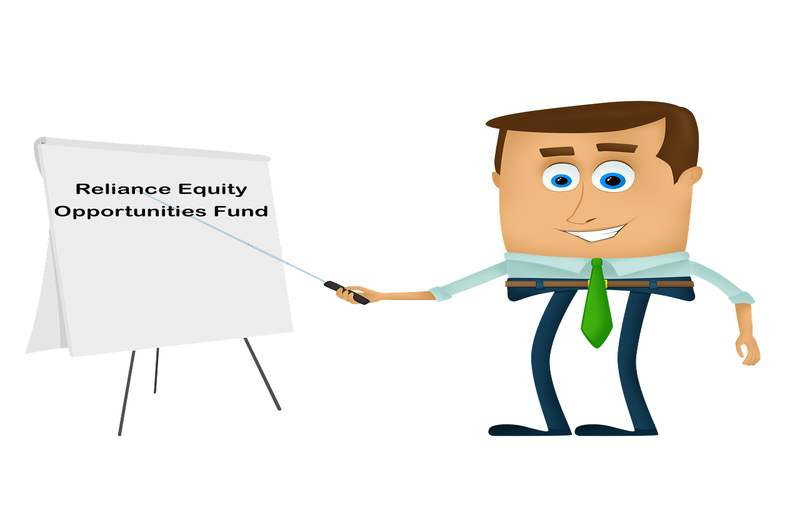 Reliance Equity Opportunities Fund is a very popular fund from Reliance Mutual Fund, in the Mid Cap segment. The Fund has an AUM of र 10,625 Crores (as on May 31, 2016). The fund is being managed by one of the well known fund managers, Mr. Sailesh Raj Bhan since inception of the fund. Reliance Equity Opportunities Fund is one of the most consistently performing equity mutual funds in the Mid Cap Category. CRISIL, however, categorises this fund as Diversified Equity Fund and has given Rank 2 in Consistent performers - Equity Funds. This is an excellent fund to own if you are looking at diversification across sectors amongst Large and Mid Cap companies which are going to be benefited by ongoing economic reforms, FDI inflows and Infrastructural changes. The 76% assets of the fund are currently invested in Financial, Services, Engineering, Healthcare and Technology. The 3, 5 and 10 years annualised returns of the fund is quite impressive at 19.94%, 14.31% and 16.64% respectively (Based on NAV of June 16, 2016). Reliance Equity Opportunities Fund – Growth Plan – Growth Option has given excellent lumpsum returns. The current value of investment of र 10 Lacs made on the launch date (March 28, 2005), would be around र 70.00 Lacs, a CAGR growth of 18.92% since inception (Based on June 16, 2016 NAV). If you had invested the same amount in S&P BSE 100 or CNX NIFTY then your accumulated amount would have been only र 30.87 Lacs and र 30.11 Lacs respectively (Based on June 16, 2016 NAV). Therefore, its return has beaten the return of both the Benchmarks by a huge margin. Simply speaking your investment in Reliance Equity Opportunities Fund – Growth Plan – Growth option NFO has grown 7 times in 11 years! Further, if you see the chart below, you will notice that Reliance Equity Opportunities Fund has also beaten the CNX NIFTY and S&P BSE 100 Index with a huge margin as far as SIP returns are concerned. You may try this tool TOP PERFOMING SIP FUNDS to check Top Funds of any category. Reliance Equity Opportunities Fund has given very good SWP returns since inception and may be a good choice for investors looking for regular income from their lumpsum investible surplus. The lumpsum and SIP returns of Reliance Equity Opportunities Fund have also been stellar and it has beaten the benchmarks with huge margin. Therefore, the fund maybe suitable for investors looking for long term wealth creation to meet their financial goals.